Average monthly cost for each commute type. Cells highlighted in red are not fully covered under the federal + state benefit. This week, Governor Brown signed into law a $75 pre-tax transit benefit for employers to offer employees. It’s a partial fix to cuts to the federal transit benefit, which dropped from $230 to $125 this year. I say partial because while the federal benefit applies to all companies, California restricts its new benefit to companies with 50 employees or more, excluding a hefty 40% of Bay Area workers. As well, it still doesn’t make the transit benefit equal with the parking benefit; drivers, who get a $240 parking benefit, still have an advantage. 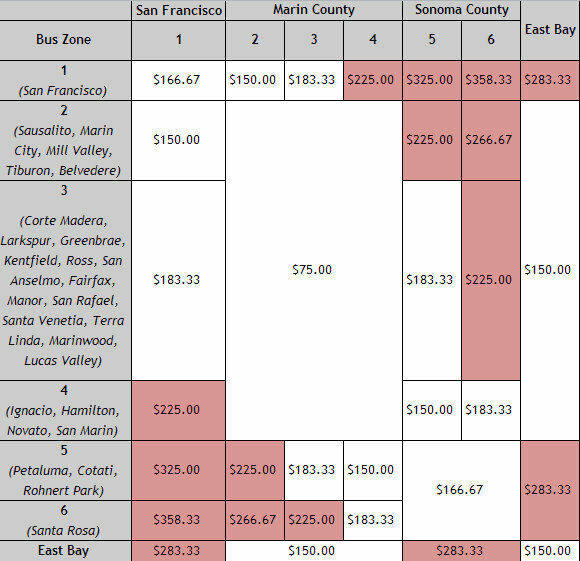 While $230 covered any bus transit commute starting in Marin and most starting in Sonoma, $200 isn’t enough to cover Novato transit commutes to San Francisco or many Sonoma commutes. California still has a way to go to intelligently promote and fund transit, and the region continues to leave low-hanging fruit like congestion pricing on the tree, but it’s good to see the state step up where Congress has failed. I suspect that given the subsidies already in place for transit, for most people who can work this additional complexity out with their employer a hundred or two bucks in deductions (which works out to, what, $80 or so if you’ve got a household income in the low six figures?) isn’t the barrier to transit use. What’s with this “subsidies already in place for transit” focus, given that it’s a small fraction of the subsidies propping up car infrastructure? Sorry, I didn’t mean to sidetrack into transit subsidies. My point was just that it’s about 20 mile commute for me. Last BTS numbers I dug into said I was paying $.50-.60/mile, my truck is old, but it’s also a gas hog, and gasoline is probably more expensive now than it was when those BTS numbers were run (though gas in those numbers was only 20% of operating costs). So let’s conservatively say it costs me $10-12 each way to drive, we’ll use the $12 number. My out-of-pocket for the bus is $2.45, plus cost for the bike. Actually, on the way here, I pay $4 to ride Golden Gate Transit rather than Sonoma County Transit, because of various conveniences. So the ability to pay with pre-tax dollars is the difference between saving $7.55 and, on a good year (this one won’t be) $8.55. As we saw, I already blow more than that difference on quality of ride of the GGT vs the SCT bus in the morning. If you’re not lucky enough to be in my income bracket, that difference is far lower. If you’ve got a two family household income of a hundred grand or so, you’re talking sixty cents, on a $12 expense. If this were lunch you’d round up. If you’re anywhere near median income you’re talking less than a quarter in savings. If you’re driving, it’s not because saving that extra quarter will make you switch to transit. Better to spend that quarter on signage, a usable website, or route planning. All of which could be done dramatically better. Probably costs more in time to figure out how to get and spend those pre-tax dollars than it saves the end user. That was my only point by mentioning the transit subsidies: My out-of-pocket cost for the bus is already $8 less, and I’ll still drive more than is reasonable for reasons completely unrelated to cost, and the barriers to figuring out how to use the transit system were similarly for this commute were similarly unrelated to cost. Please stop using the cliche, “low hanging fruit”. The reader’s mind turns off instead of engaging with your thoughts. Consider it banished from all but the most literal uses. I suggest we make “slow moving target” the new cliche replacement. Do you have some sort of process that’s searching for the cliche across the web or the articles you read, or are you just going after the low hanging fruit when you see it? If and when transit stops looking for subsidies and starts finding real economic opportunity, we’ll feel reassured they’re looking to solve some real problem. As Jym Dyer points out up-thread, it’s hard to call ’em subsidies until we can untangle the various externalities and indirect costs of all of our transportation options. Implement a VMT to start directly billing for road use and raise gas taxes to cover the actual costs of energy, then figure out some way to account for transit agencies with more fixed infrastructure to account for real-estate value capture (ala Japan’s railways), and I suspect you’d see a dramatically different playing field. Until then, it’s hard to point simply to a lack of fare box recovery and say “subsidy” with any credibility.